Escape to beautiful Bundalong. Waterfront three bedroom home with huge undercover outdoor entertaining area complete with bbq, gas stove, dishwasher, large drinks fridge, 50 inch plasma, microwave and kitchen utensils . 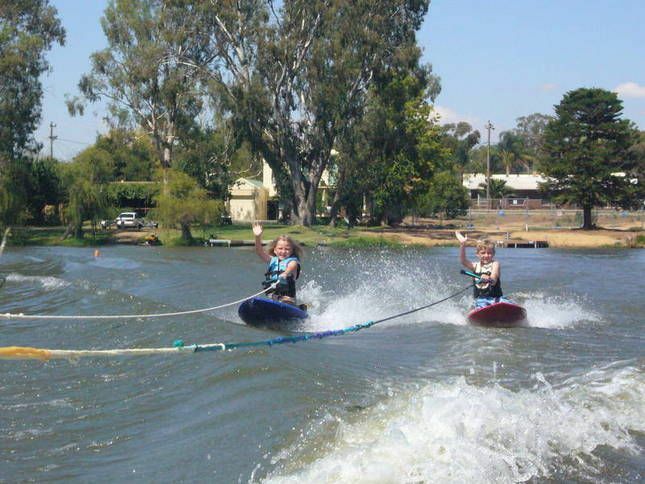 One of the best spots on the Bundalong strip to ski in and ski out all day long. The whole family can enjoy a swim on your own little strip of beach. Park your boat directly out your front door. From the deck to the water is lush lawn and you can easily see all activities on the water. Short stroll to the Bundalong Tavern and the Bundalong General Store. Yarrawonga/Mulwala 15 min drive. Rutherglen wineries are also close by. The house is complete with all necessities. Bedrom 1 - Queen size bed, Bedroom 2 - Queen size bed plus Single Bed Bunks and Bedroom 3 - 2 Sets of Bunk Beds, Comfortably sleeps 4 adults and 6 kids. Two bathrooms & two toilets. Please note no pets or smoking in the house. You can’t go past how good the old door kitchen set up is, house was perfect for our needs ! Great spot on the river we’re we spent most of our time !! Will be back agin.. Perfect setting very relaxing has everything you would need will be going back here not a problem! Lovely house and a great weekend away. The set up was fantastic and suited large groups perfectly. We loved the style of the house and it even gave us some ideas for our own renos. Covering some of the decking with a roof or shade cloth would be the only thing I'd change as it was in the full sun so we couldn't enjoy this space. Great spot on the river! We'll be back! Loved the location and the facilities on the property! Excellent entertaining area!! Fantastic accommodation at a fantastic position. Loved the commercial kitchen and lawn area down to the boats. Had a minor hiccup and the owners were only a phone call away and great help. Will definitely be staying there again and can not wait. Amazing Location with great outdoor facilities. The outdoor area has everything you need to prepare and cook you meals, while keeping an eye on the kids as they play on the lush green grass. We look forward in staying there again in the future! !